In another jolt to the Bahujan Samaj Party, Mayawati's once trusted lieutenant and former minister R K Chaudhary on Thursday quit the party accusing her of "auctioning" tickets to contest assembly polls in Uttar Pradesh. "At election time, tickets are allotted to the person who pays the highest amount," he said, announcing his resignation from the party at a press conference. In a vitriolic attack on Mayawati, he said since the death of party founder Kanshi Ram, there has been a marked change in her working style and veteran leaders, who functioned with missionary zeal, were not given adequate weightage. Chaudhary, 57 said Kanshi Ram had united different castes under one banner and evolved them into a group which could not be "sold" and due to his concerted efforts, a vote bank was created in all the assembly constituencies of the state. "But after Kanshi Ram, Mayawati started eyeing this non-saleable votebank and began selling tickets and the BSP became a 'mandi' (wholesale market) for ticket selling... Under such circumstances, the party is no longer the mission of social change," he said. Alleging that the BSP has deviated from the ideology of its ideologues, Chaudhary said capitalists have now come to the forefront. "I have to resign from the party out of complusion...Many more will leave it in times to come," he said, adding he will hold a meeting of his supporters on July 11 and chalk out his future course of action. A known Kanshi Ram loyalist, Chaudhary, along with senior leaders Barkhu Ram Verma and Krisna Pal Singh, was unceremoniously expelled by the BSP chief on July 21, 2001 for opposing the party's stand on reservation to the most backwards and Dalits. He had, however, returned to the party on April 12, 2013 after over 11 years and is perhaps the only leader to be reinstated in the party and given the key post of coordinator after a long hiatus. When he was out of the BSP, he had floated the Rashtriya Swabhiman Party and had extended support to then Samajwadi Party government led by Mulayam Singh Yadav. Chaudhary was among the oldest BSP members and had stood by Mayawati on June 2, 1995, when she was allegedly attacked by Samajwadi Party workers in the state guest house in Lucknow. This is the second major setback to Mayawati after senior leader Swami Prasad Maurya quit the party, saying he felt "suffocated" and accusing the party chief of "auctioning" tickets for next year's assembly polls. 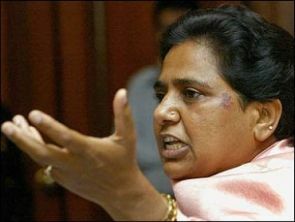 "Tickets are being openly auctioned by Mayawati on a large scale. She is not making the right choice of candidates. Tickets are not only on sale in the party, they are being auctioned," he had said. Maurya, who had resigned from the BSP on June 22, had also accused Mayawati of "murdering" the values and principles of B R Ambedkar and Kanshi Ram. Modi's new ministers to be sworn-in on July 4?